In these two pages we will consider some of the most popular types of bin in use for the composting of uncooked kitchen and garden waste, bins made from recycled plastic. There are a wide range of plastic bins available starting with the simple “Dalek”, available from many Councils at a subsidised price of about £16-£18 delivered (See www. Getcomposting.com). These bins are often the first bin owned by many people and forms their introduction to composting. 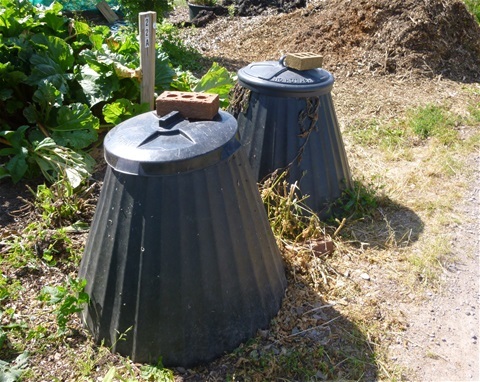 However the range of plastic bins is large and there are a variety of more expensive and better bins to which composters can progress. These include square, slotted and insulated bins with larger models compete with thermometers, to monitor temperature costing several hundred pounds. The details below is not exhaustive but if I have missed one which you as a user or supplier would like included please contact me. These bins consist of a recycled plastic open at the top and bottom. They are normally supplied with a separate, rather than an attached, lid and, in some cases a base plate. They usually have an inspection or harvesting hatch at the bottom. In some models, the hatch is held in place by pushing part of it behind the edge of the bin. When the bin is filled, it may distort slightly making refitting the hatch difficult after harvesting and, overtime, the plastic edges of the hatch may split. Replacement hatches may be purchased from Get Composting. Given the choice, some decide to pay a little more and get one of the versions with a sliding hatch. In most cases, the hatch is relatively small and although it is relatively easy to harvest compost using a border spade many people prefer to harvest and remix the compost by tapping the bin to loosen the contents and lifting the bin leaving a neat compost mound. The empty bin can be placed on the ground next to the heap and the uncomposted material forked into the now empty bin. I have a colleague who uses this technique to aerate the compost emptying and refilling the bin fortnightly. This style of bin is normally supplied in black or green. 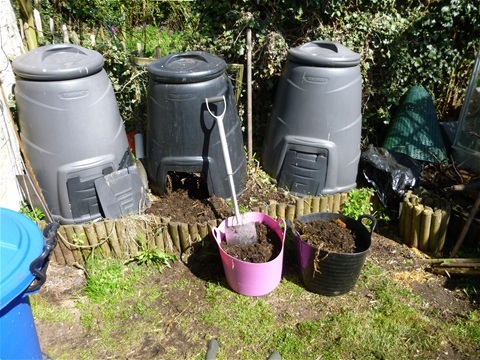 The bin is light in weight and can be easily lifted off the compost for emptying and moved round the garden to meet changing needs. 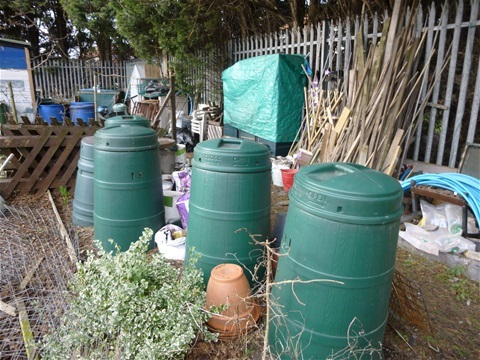 Empty or partly filled bin, tops or hatches may be blown across the garden or allotment site by strong winds. On allotments this enables plot holders to play hunt the bin and talk others on the site. Labelling bins, lids and hatches with the plot number saves problems during any bin identity parade after a storm. 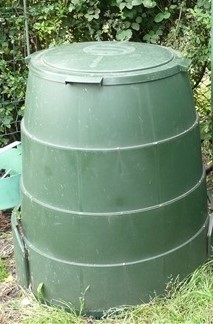 This type of bin is normally placed directly on the soil in a sunny part of the garden or plot. As they tend to be relatively small with a capacity of 200 or 300 litres, they are likely to dry out in the summer and may need the occasional addition of water or preferably the sludge from Compost Tea making. As the bin is not insulated, it will only work effectively during the warmer months and will slow down or stop during the winter. Bases, which seal the bottom of the bin reducing the likelihood of rats gaining access, can be purchased for some models. Fitting a base also means that the bin will not be blown off the compost and across the garden in strong winds. The lid is usually of a simple push-on design. The Blackwall Compost Converter is made from recycled plastic and supplied in two sizes, 220 litres and the 330 litre. I would recommend the larger size as the smaller bins are more likely to dry out during the summer. Fitted with a hatch held in place by pushing part of it behind the edge of the bin, which as mentioned may become difficult if the bin is filled and distorted slightly. These composters are available at subsidised prices in many Council areas. The220 litre was voted best "BUDGET BUY" in the December 2012 issue of Gardeners' World. A good value introductory bin, at one stage I had three of these at home and another three on the allotments. The Rotol Compost Convertors is manufactured in Devonshire from 100% recycled. It was winner of Gardening WHICH Best Buy. Garden King Composters are also manufactured in Devonshire from 100% recycled materials and moulded to a robust design with an easy to use sliding access hatch. 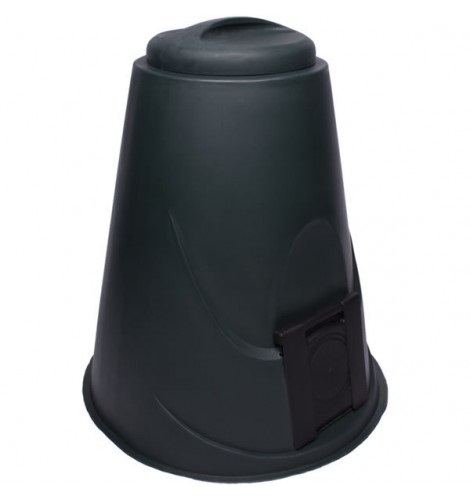 The Eco composter is one of a wide range of plastic compost bins made by Garantia. Others are listed below. 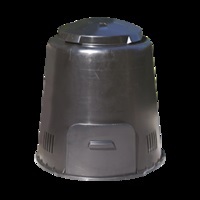 The Garantia Rapid composter is also made from recycled material has a capacity of 280 litres. It has a two part hinged lid for ease of filling and a sliding door for easy harvesting of the compost. There is a perforated bottom with air channel. A hot composter, the Green Johanna recycles garden and kitchen waste including cooked food, bones, meat and fish. The Green Johanna provides good ventilation with an adjustable lid and base. Unlike many systems it should be installed in a shady part of the garden. It is designed for kitchen waste from up to five people together with the compostable waste produced from an average garden. It has two sliding doors making it easy to harvest. A winter jacket can be supplied to keep it operating when the average outdoor temperature consistently falls below 5°C.